Port Renfrew is about as far west as you can get, right? Maybe not..... Jeremy Gatten and I joined up with Rick Shortinghuis, Charles Smith, and Ray Woods, Phil Cram, and Brian Elder of "Fur and Feathers 500" fame on a pelagic trip out of Tofino on September 12th. With visions of pterodromas dancing in our heads, we left Victoria at 8am on Tuesday, Pacific Rim National Park in our sights. After a quick stop at the Tim Hortons in Port Alberni, which netted us a Yellow-rumped Warbler, Red-breasted Sapsucker, and Eurasian Collared-Dove, in addition to coffee, the all great life-sustaining bean beverage, we headed on to our first serious stop, Wikkaninnish Beach. found 2 Pacific Golden-Plovers here. We found the beach to be fairly quiet, with very few passerines, including a single Fox Sparrow, and only a few Red-necked Grebes (recent arrivals) in the surf. From there we headed to Comber's Beach, where we a few more species, including an incredible 30 Herring Gulls, but only Black Oystercatcher and Western Sandpiper in the shorebird category, the main reason for our many stops. 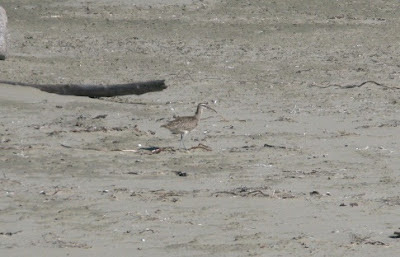 Long Beach provided a bit more excitement, with a Whimbrel feeding high on the beach, and another Black Oystercatcher. Grice Bay was also quiet. Chesterman Beach is a location that neither Jeremy nor I had visited in the past, and we made a point of walking the entire length. This stretch of sand and rock turned out to be the highlight of our days birding, as we turned up a single Baird's Sandpiper foraging with 14 Western Sandpipers, a flock of 14 Sanderling, and 8 Black Oystercatchers and 4 Black Turnstones. Not bad at all, but still none of the Asian vagrants we had hoped for. Our last pre-dinner stop was the end of Sharp Rd, where we scoped 200+ Western Sandpipers without so much as a Semi-palm or Least. A quick stop at Wildside Grill was dinner, after which we headed back to Long Beach. The Whimbrel we had found earlier was still in pretty much the same spot (and pretty much the only bird around), but we did manage to add 100+ Sooty Shearwaters streaming by over the horizon. Wednesday morning dawned full of promise, with a Swainson's Thrush calling outside our five star room at the Dolphin Motel (chosen for convenience, as it is located at the corner of Sharp Rd and right near Chesterman Beach. Nice rooms, but definitely no resort!). We made our way to the rendezvous point with a coffee stop along the way, and were suited up and on the boat just after 7am. We were only a few kilometers out when we started seeing our first birds, Sooty Shearwaters, followed not long after by the odd Pink-footed Shearwater. 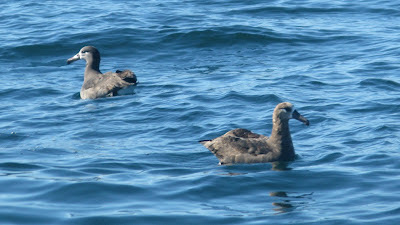 Soon, Red-necked Phalaropes and Cassin's Auklets began showing, the latter providing stunning, boatside looks. A real treat for any birder! As we approached the edge of Clayoquot Canyon and began to contemplate chumming, we were surprised by a lone Black-footed Albatross that had managed to sneak up behind us, no doubt following the trail of orange peels I had left for it. After ascertaining that we had nothing to offer, the albatross left us as suddenly as it had appeared, and we continued on to set out some chum. At this point we also had distant looks at what appeared to be a Long-tailed Jaeger harassing Sabine's Gulls. We gave chase, but the jaeger proved faster than the boat, and we lost sight of it. Getting no bird love from the chum we moved further into the canyon, to a point our guide, Artie, called "The Abyss". A little daunting, and perhaps melodramatic, but this is where we set out our second bit of chum, a concoction of fish bits and cheerios (even tubenoses need to watch their cholesterol, apparently). Before long we had a taker, a Black-footed Albatross, which was quickly joined by another, then by a stunning Parasitic Jaeger. Eventually, the mixed feeding flock totalled 6 Black-footed Albatross, 2 Pink-footed Shearwaters, 2 Sooty Shearwaters, the jaeger, and a drop-in Fork-tailed Storm-Petrel that gave everyone looks before taking off. After the lunch show we turned for the 42 mile journey back to terra firma, finding the occassional flock of phalaropes or flyby shearwater. Among a scattered flock of alcids, we located 3 Tufted Puffins, always a treat to see! These birds were in various stages of acquiring their winter look, which trades snappy black and white with gold edging for all black, maintaining the honking orange bill. Luckily, these birds still had their golden "tufts". 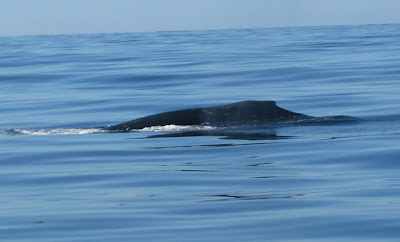 About 11 miles off Cleland Island, we encountered another treat, a group of Humpback Whales. True, they aren't birds (and how would Victoria Whaler sound as a blog title?) but they were absolutely stunning as they approached us. 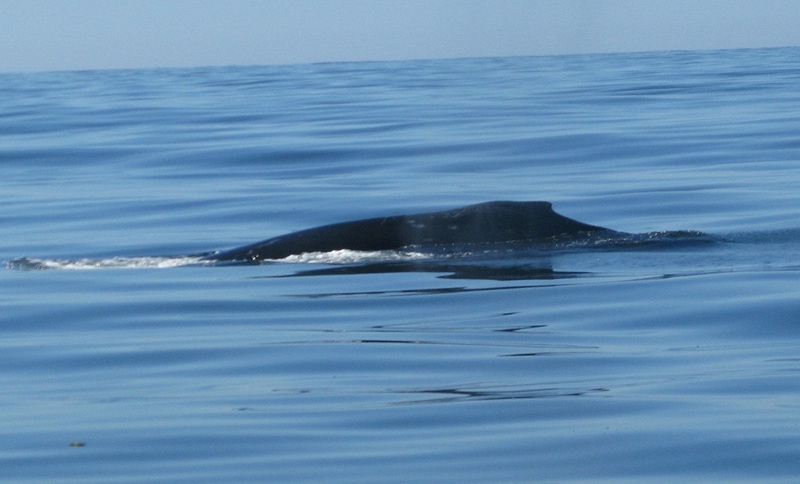 We had cut all power and had been drifting for 10 minutes or so when they passed closely beside us, thrilling all on board, and carried on to where ever it is that whales go. For a very shaky YouTube video of the encounter, check here. We added a few other birds on the way back in, including Marbled Murrelet, Pigeon Guillemot, and Red-necked Grebe, but the last highlight was definitely sightings of 4 Sea Otters drifting in the kelp! The weather and company couldn't have been any better for this trip. While the birds were not as dense as we had all hoped, you just never know what those pelagic species are going to do! Huge thanks to Ray, Brian, and Phil for organizing this trip and having us along, and to Rick and Charles for rounding out a fantastic group! For another perspective on the trip and some fabulous pictures, see the Fur & Feathers 500 blog here. The Naturalest Naturalist also got some fantastic pictures over both days, and should have those posted soon as well. A quick lunch at Big Daddy's Fish Fry and Jeremy G and I were headed south again, making one fruitless stop at Long Beach before heading straight for Victoria, with breaks only for coffee in Port Alberni and Ladysmith. All in all, not a bad way to spend a couple of days, the countdown clock is now on for the September 22 Westport Trip!